TENKER upgraded the brightness of this projector with 30% more Lumens to offer our customers higher cost-effective product. Latest Upgraded Projector 1080P Supported - Our Tenker Upgraded Mini Projector is great designed for indoor and out door movies in dark. You will surely enjoy your happiness movie night with your family easily. This projector will provide you with an excellent home cinema experience. PLEASE NOTE, as this is a home entertainment projector, we do not recommend it for PPTs or business presentations. LARGE SCREEN VIDEO PROJECTOR - Don't be fooled by this mini projector's small size. You can enjoy your favorite movies on a screen size of between 32-176 inches with a projection distance of 1.5-5m. Furthermore, by placing the projector at the optimum distance of 1.8 to 2.0m, you will achieve a super-clear and bright projection. 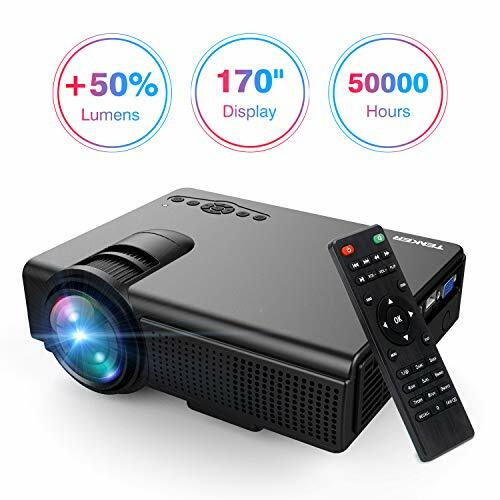 MULTIMEDIA CONNECTION - This full hd projector also has HDMI, AV, VGA, TF Card port, which allows you to use it with Laptop, PCs, TV Box, Amazon Fire TV Stick, ChromeBook, Tablets, Blue-ray DVD player, TF cards (max 64GB), USB Flash Drive, Media players (Music, Pictures, Video), IOS, Android Smartphones ( Wireless HDMI Dongle not included). REDUCED FAN NOISE - This innovative cooling system of our Tenker projector provides awesome heat dispersion. As well as this, the fan sound has been cut in half using noise suppression technology; this translates into less distraction when viewing movies or playing games. 3-YEAR WARRANTY - We're so confident of the quality of our product that we provide a 3-YEAR warranty and professional customer service & technical support. If you have any problem or question, please feel free to contact us anytime!